Black holes are areas of spacetime that display extraordinarily strong gravitational conditions in which nothing, not even light, can escape once captured. They act as physical forms, with their surrounding “event horizons,” that absorb all incident electromagnetic radiation and reflect no light. Scientists theorized the existence of these objects as early of the 18th century. They thought that black holes resulted from the dying of large stars that imploded in on themselves. After forming, black holes act like giant vacuums sucking in all substance from its surroundings within its irresistible gravitational pull. Only recently on April 10, 2019 have scientists, with the aid of the Event Horizon Telescope, seen what they had previously only speculated. They found and filmed the supermassive black hole Pōwehi at the core of giant elliptical galaxy Messier 87. It’s mass equals 7 billion times that of our Sun. According to established laws of physics (conservation laws), matter is neither created nor destroyed. Renowned physicist and cosmologist, Stephen Hawking, however, argued that matter consumed in a black hole seems forever lost in the universe, which if true, poses a serious contradiction. 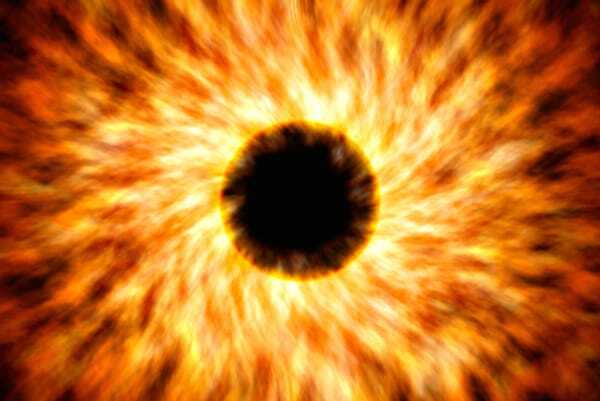 Black holes are thought to exist in virtually every galaxy, including our own. In our current era here on planet Earth, we have witnessed a moderately large star toward the end of his life cycle imploding in on himself. He too devours everyone and everything in his path, which, for some, presents an irresistible gravitational draw. This apprentice star in the Milky Way Galaxy also reflects no light, but instead, destroys reputations and careers sucked into his overwhelming power-pull of enticements. One by one he consumes bodies that swirled around his once star-cast orbit. By so doing, he has confirmed beyond a reasonable doubt Hawking’s assertion that black holes do, in fact, destroy matter that never reassembles into other forms of matter or energy. It doesn’t take a mega-telescope to observe this black hole in this White House gobbling up values of civility, decorum, compassion, and empathy never again to see the light of day. It demolishes ties with former allied planets setting them on a hopefully not irrevocable course into deep space in galaxies far far away. It consumes moral and ethical standards with fear and hatred to fill the void left behind, and in doing so, contradicts established rules of law, which vanish without a trace. The black hole emanating from this White House emphasizes this President’s simplistic black and white binary view of the galaxy of me versus them, good versus bad, friends versus enemies, my instinct versus their unwanted guidance, my truth versus their lies. Only the voters can conserve what remains of the light and the good of our planet and of the once-revered office of the Presidency of the United States of America.